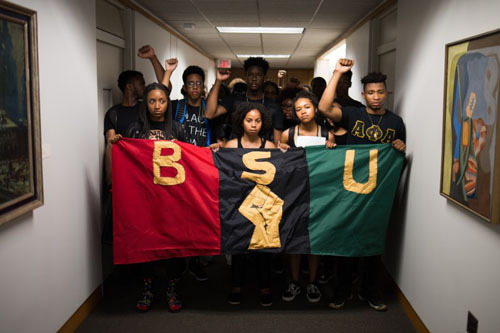 Black Students United, a group for students identifying with the African diaspora, handed the university president a list of twelve demands, with one of them dealing with the disproportionate representation of African students compared to black students on the campus. Evidently Africans don’t count as black anymore. It isn’t easy to keep up with moonbat taxonomy. “We demand that Cornell Admissions to come up with a plan to actively increase the presence of underrepresented Black students on this campus. We define underrepresented Black students as Black Americans who have several generations (more than two) in this country,” the group stated in their demands. The militants are enraged that there are more black foreigners from Africa and the Caribbean at Cornell than properly “oppressed” American blacks. “The Black student population at Cornell disproportionately represents international or first-generation African or Caribbean students. While these students have a right to flourish at Cornell, there is a lack of investment in Black students whose families were affected directly by the African Holocaust in America. Cornell must work to actively support students whose families have been impacted for generations by white supremacy and American fascism,” the group wrote. By the time pampered Affirmative Action parasites are through whining, words like “Holocaust” and “fascism” will have no meaning at all. BSU militants don’t want to share their black privilege with Africans. On a tip from Chronos Z. Wonderpig. Cross-posted at Moonbattery.